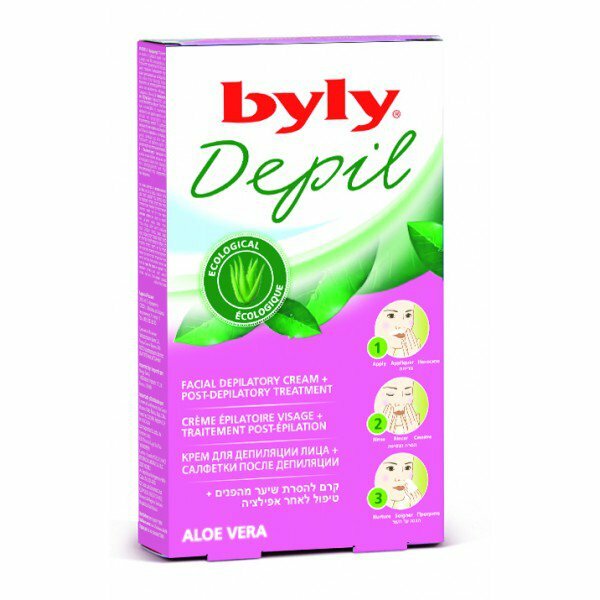 Aloe Vera Facial Depilatory Cream is produced by the Spanish brand BYLY. The product has an especially delicate formula which is designed to gently remove unwanted facial hair. The cream is formulated with 100% natural aloe vera leaf juice that acts as a natural, soothing moisturiser for your skin. It also contains Boswellia serrata gum (also known as salai or shallaki) which has anti-inflammatory properties. This BYLY facial hair removal cream is suitable for all skin types including even very sensitive skin. It painlessly weakens unwanted facial hair so that it is easily removed, leaving your skin clean and smooth. Due to natural aloe vera leaf juice and boswellia gum, the cream takes care of your skin after depilation. It soothes and moisturises the skin, preventing redness and irritation. Aloe Vera Facial Depilatory Cream for sensitive skin will make your skin silky smooth in just 3 steps: spread the cream, leave it on for 5 to 10 minutes, then rinse. That's all! No pain, no redness, no irritation. The package also contains post-depilatory wipes that soothe and moisturise the skin. Package contents. 5 x 2 ml facial depilatory cream sachets, 5 post-depilatory wipes. Directions. Wash your skin with warm or lukewarm water and let it dry. With your fingers, spread a thin layer the cream evenly to fully coat the hair. Wash your hands immediately. Leave the cream on your skin for 5 minutes. Gently remove a small test area. If the hair is not removed easily, wait a couple of minutes more and retest. Rinse off the cream thoroughly with warm water. Gently wipe your skin with a post-depilatory wipe. Precautions. Do not leave the cream on your skin for more than 10 minutes. Do not use on irritated, sunburnt, inflamed or injured skin, moles. Read the instructions carefully before applying the cream. Ingredients. Depilatory cream. Aqua (Water), Cetearyl Alcohol, Paraffinum Liquidum (Mineral Oil), Calcium Thioglycolate Hydrozide, Calcium Hydroxide, Ceteareth-20, Sodium Hydroxide, Parfum (Fragrance), Aloe Barbadensis Leaf Juice, Boswellia Serrata Gum, Isostearyl Alcohol, Silica, Disodium EDTA, Citronellol, Linaool, Geraniol. Post-depilatory treatment. Aqua (Water), Cetearyl Isonoanoate, Aloe Barbadensis Leaf Juice, Ceteareth-20, Cetearyl Alcohol, Clyceryl Stearate, Glycerin, Ceteareth-12, Cetyl Palmate, Allantoin, Disodium EDTA, Phenoxyethanol, Metylparaben, Butylparaben, Ethylparaben, Propylparaben, Isobutylparaben, Bezoic Acid. Want to buy Aloe Vera Facial Depilatory Cream? Call us or submit your order via our web site! BYLY Depil cosmetics, often referred to as simply BYLY, are a series of hair removal products produced in Spain. They are manufactured by Laboratorios BYLY, S.A. The company is headquartered in Barcelona, it has been producing quality personal care products since 1942. Along with hair removal products, BYLY offers its consumers deodorants, foot care products (gels, creams and sprays branded as Byrelax), hand creams and body milk. Laboratorios BYLY, S.A. produces high-quality, innovative cosmetic products. It adheres to the eight quality management principles defined in ISO 9002 standard which is confirmed by a corresponding certificate. The company uses technologies that cause minimum damage to the environment. The company's research and development department is constantly searching for new solutions to make sure that all product formulas are simultaneously effective and safe for human health and the environment. BYLY Depil is one of the company's most popular brands therefore Laboratorios BYLY, S.A. pays much attention to the quality and efficiency of its hair removal products. The brand offers a variety of wax strips, depilatory creams and warm wax that contain natural ingredients such as cocoa butter, peppermint extract, green tea extract, peach extract, papaya extract, aloe vera extract and even gold. They not only effectively remove unwanted hair, but they also nourish and hydrate your skin, make it noticeably softer, prevent irritation, inflammation and ingrown hair.